Spring leads the way to warmer weather, beautiful blooms, and lots of sitting out on the porch listening to the birds! 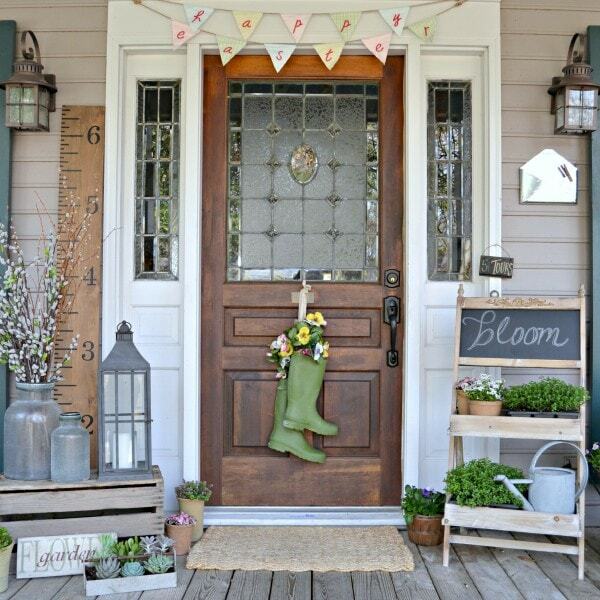 And it’s no surprise I love decorated spring front porches! When you want your home to feel more welcoming, inviting and fresh, there’s no better spot to spruce up than the entry. Spring updates to your front porch and outdoor living areas aren’t difficult either. All you need are a few cheery items to really brighten up the space. So, get rid of the drab of winter by dressing up your porch with pretty plants, hanging baskets, a freshly painted chair, and other fun décor. 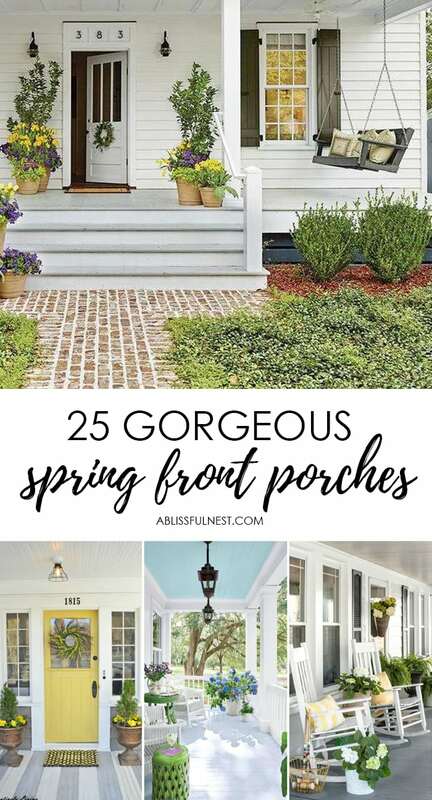 If you’re looking for beautiful spring front porch ideas, I’ve rounded up the best of the best I could find. 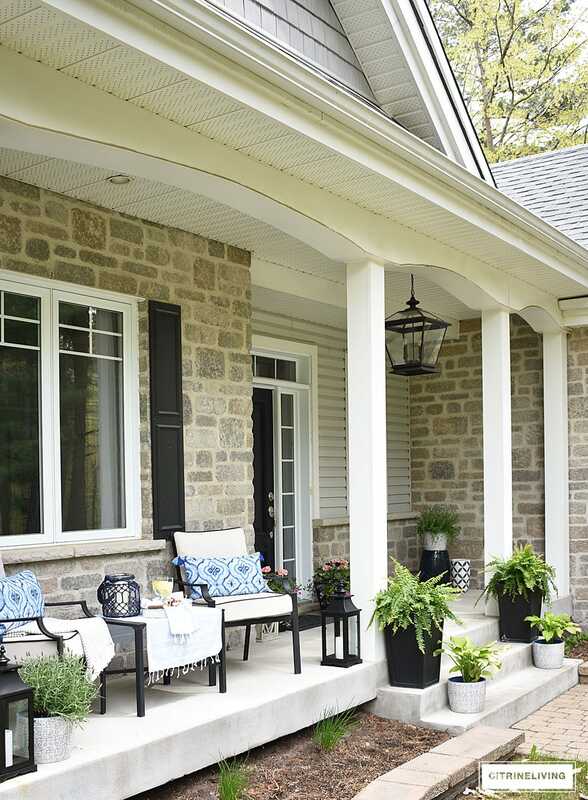 These cute spring front porch ideas provided me with plenty of inspiration to recreate the looks on my own porch. I’m sure you’ll find decorating ideas for your front entry too. 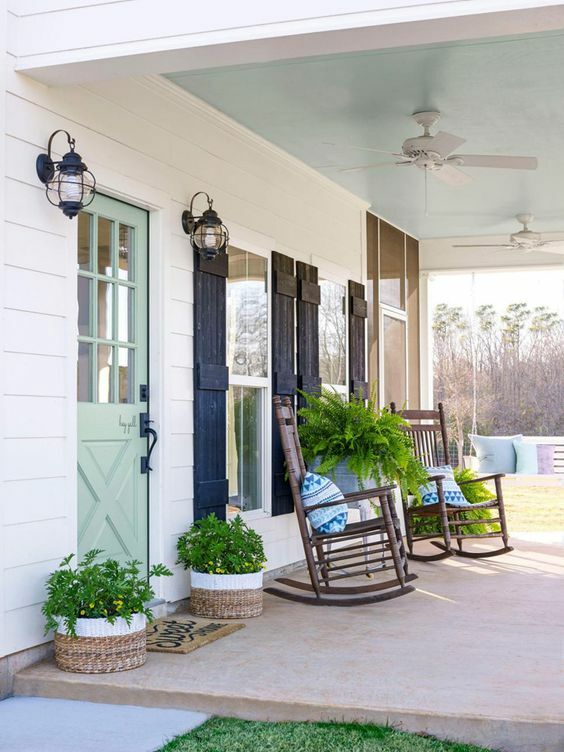 One thing is for sure: these 25 spring front porches and outdoor spaces really have me wishing we aren’t going to see any more cold days coming up! I’m ready for spring! 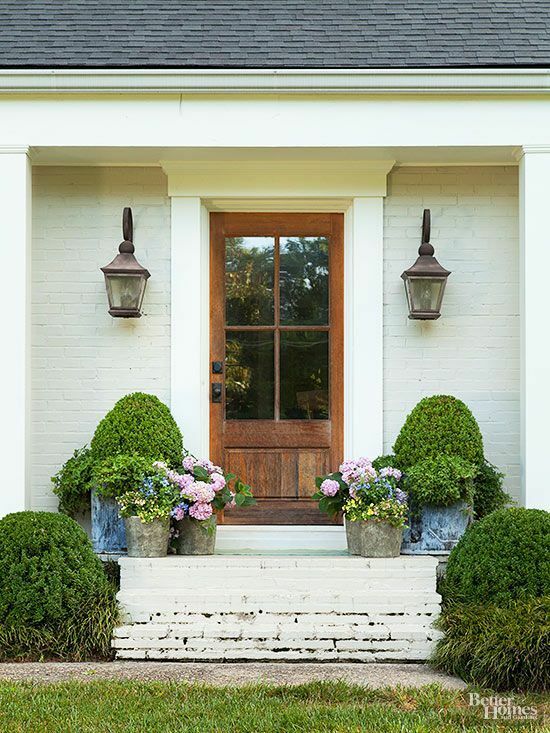 If all you have is steps leading up to your front door with a small stoop, create a formal look with a couple of pots with big greenery (like boxwoods or topiaries). The big pots of greenery could last through several seasons. Offset your big pots with a grouping of smaller ones to provide a pop of colorful spring flowers in sweet pastels like pink and yellow. I love the blue and white buffalo check used to frame the “Howdy” doormat, Heather used on her front porch! It is the perfect bright color for spring! The blue and white checks are echoed in the ribbon on the all-green wreath with a sweet, simple bow. 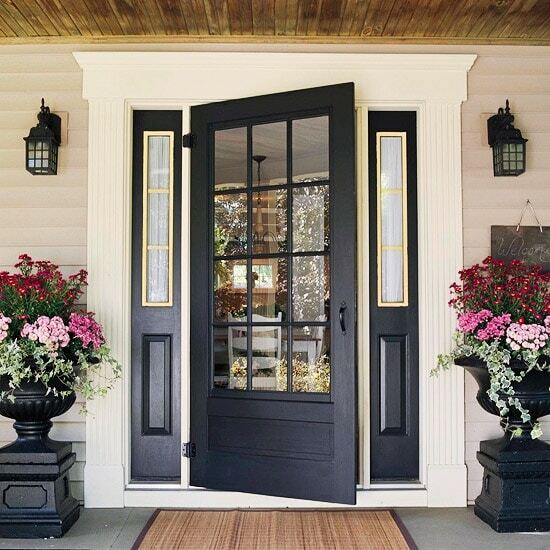 The combination creates a friendly, inviting front door, which wouldn’t cost much to recreate. Any guest would feel totally welcomed on this garden-friendly porch! I really love the rain boots with fresh flower decorations in lieu of a wreath! The watering can, and small pots of flowers create a sweet vignette offset with the darling bunting across the top of the door. This is a great example of how your porch can really show off your personality–it’s clear this homeowner loves to garden! I love iron pieces like this industrial style porch light on the wall. The coral colored chair looks darling with the black and white numbered pillow, which calls back to the black design on the floor mat. White flowers tie this whole, elegant front porch look together, especially with a pretty grapevine and floral wreath! A bright yellow floral wreath really says Welcome Spring! 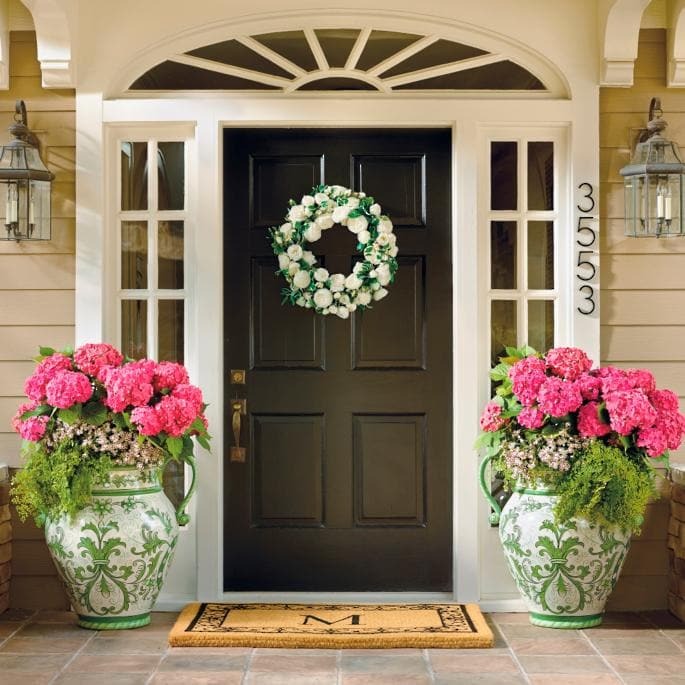 The bright topiaries that flank the door and the beautiful urns are great spring front porch ideas because they will last season after season with a few color updates. 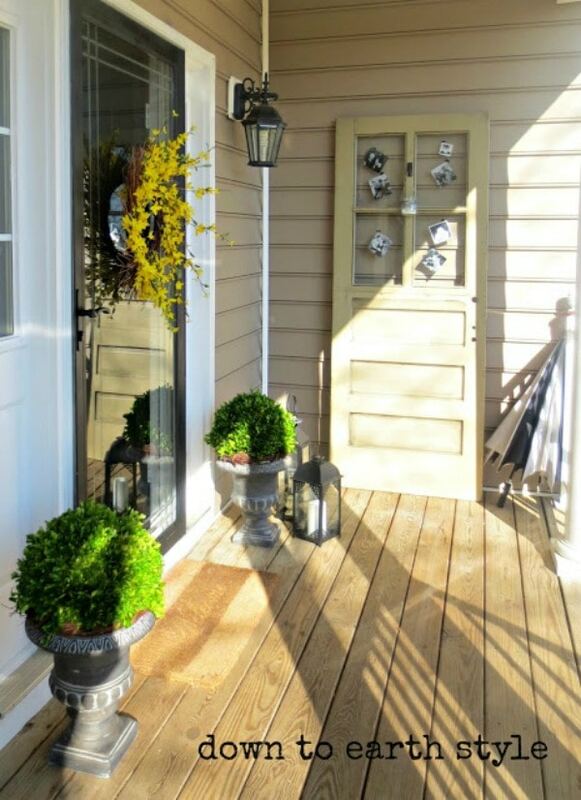 And the door with photos in the glass is such a great touch–what a unique and fun way to repurpose an item as front porch decor. 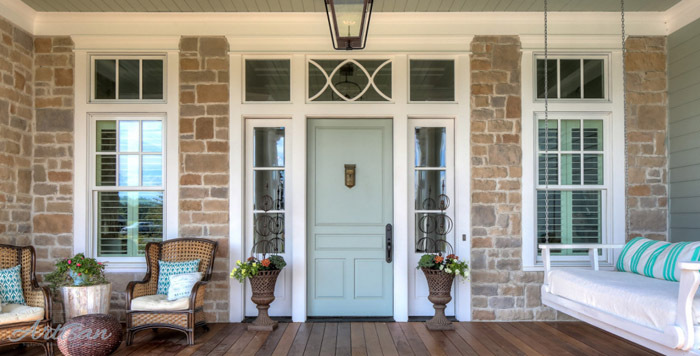 Freshen up your porch with farmhouse style touches and a beautiful painted door. The sweet mint color on this door looks so delicious next to the pink flowers and buffalo checked pillow. 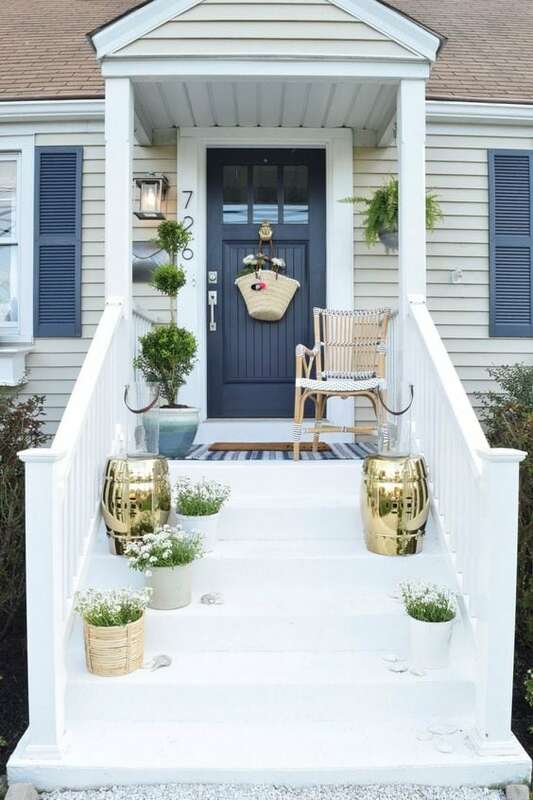 This front porch is proof you can work with a very simple color scheme—white, tan and black—and use a few bright touches to bring life and vibrancy to a front porch. 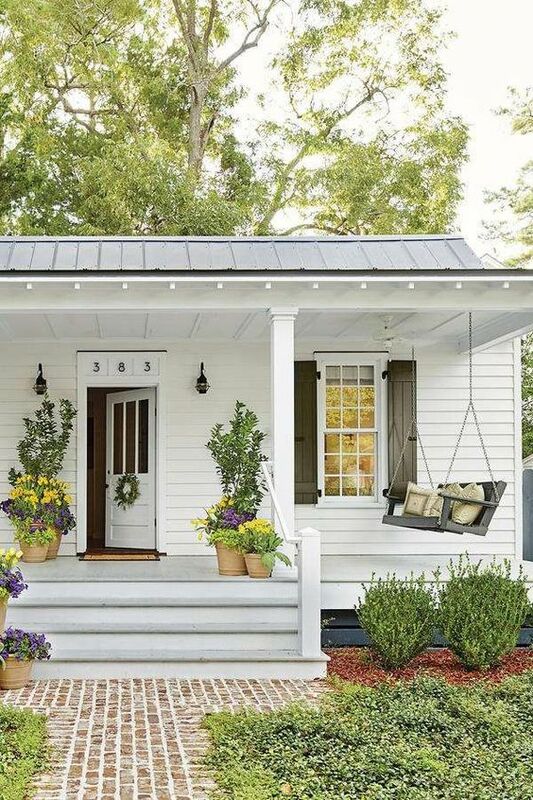 This southern porch was made for outdoor living–relaxing and enjoying conversation. 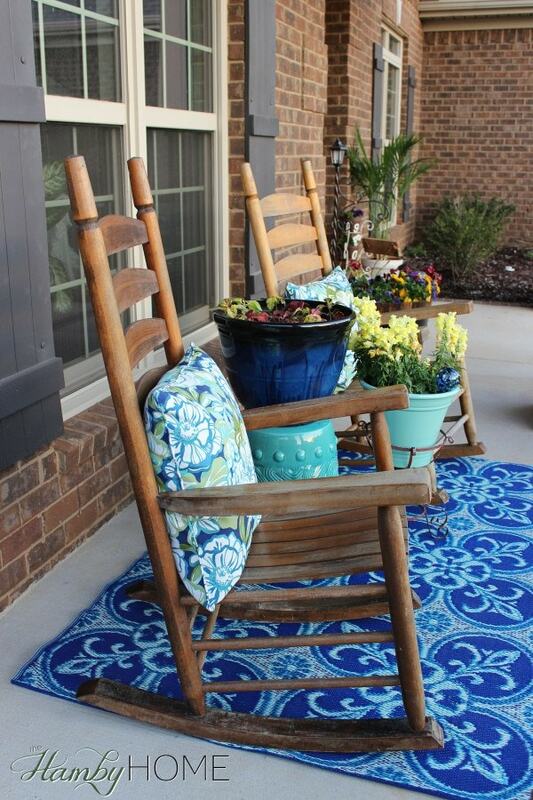 Use the extended porch to create a seating spot with fun pops of blue. The neutral black and white furniture, pots and touches on this porch work well with any accent color they’re paired with. One universal truth about spring front porch ideas is they almost always incorporate bright, cheerful color into the design scheme. This seaside blue is elegant but very cheery! 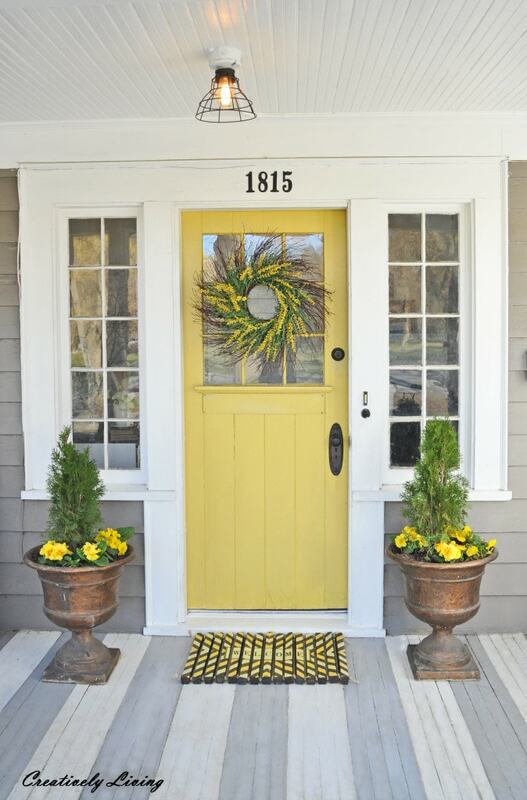 This is such a pretty sunny yellow color for the front door and adding flowers in the same color really help it stand out. The antique urns look great with the little yellow pansies tucked in under the evergreens. 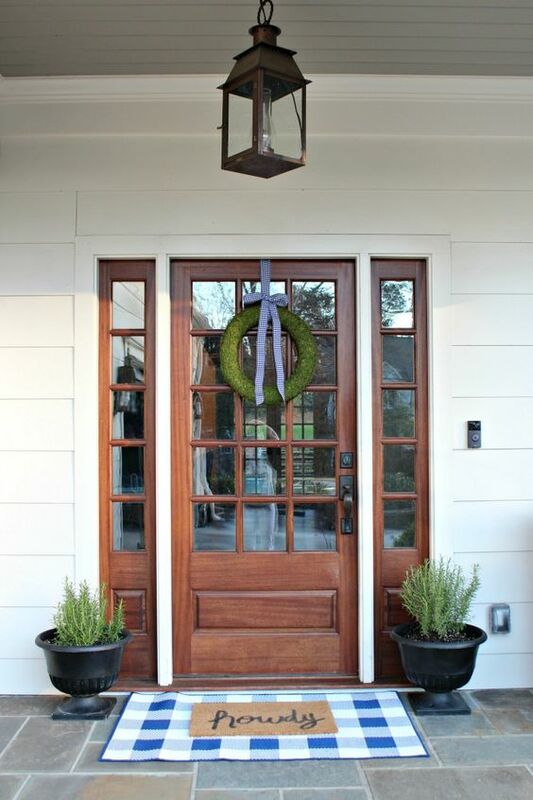 The wreath on the door and cute wooden mat (love the geometric pattern!) pick up the yellow theme once more without appearing overdone or fussy. I love the gorgeous shade of turquoise on this ceiling. It is so bright and fresh! 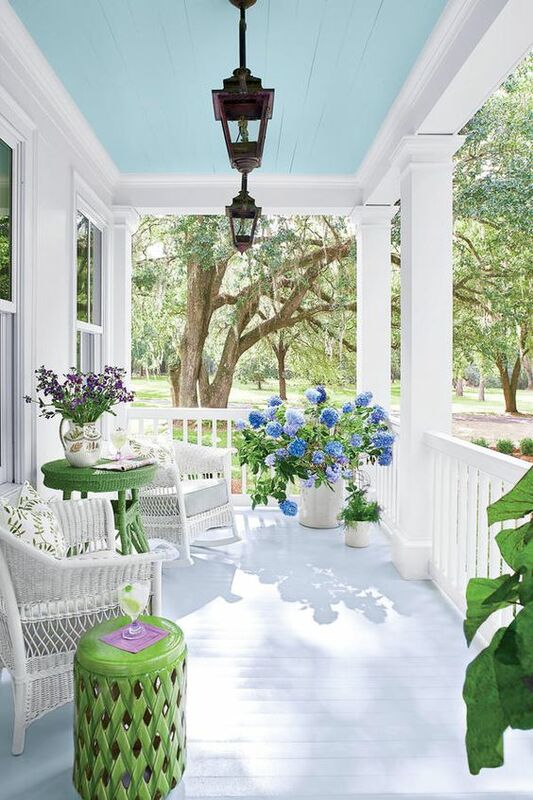 Blue ceilings are common on southern porches to echo the blue sky above. This porch seems perfect for a mint julep or lemonade (which may be exactly what’s in the glass on the beautiful bright green table). The elegant white pots and white wicker furniture go with any pretty fresh flower, and the hydrangeas look especially stunning. 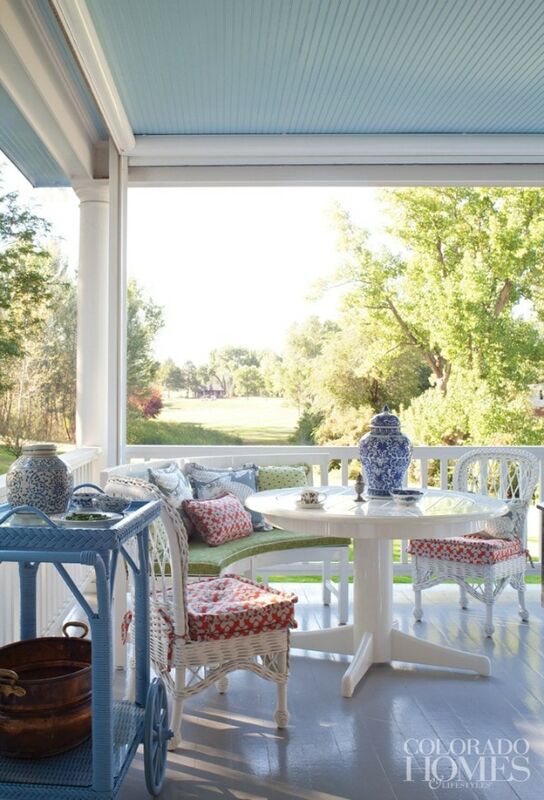 This makes me totally wish Spring was here now, this porch is gorgeous! A tea cart is one of the cutest decorating ideas for housing a few porch-items and creating a great platform for additional decorations. The twin white rocking chairs look great with the bright blue pillows and even though this porch is small, it really stands out! The gorgeous shutters really set the stage for this beautiful spring front porch! A simple arrangement of twin rocking chairs around a fern look like a great spot to spend a warm spring evening. The porch swing caps the end—a perfect outdoor living space with extra seating for lazy afternoon reading. 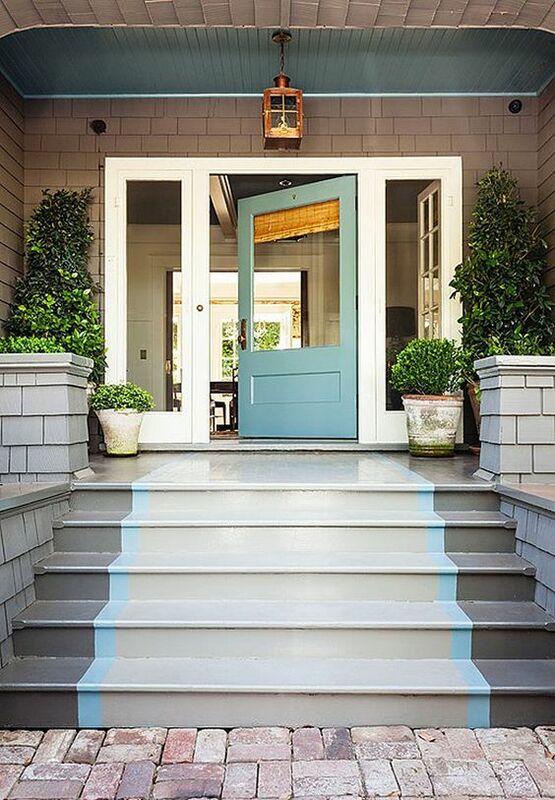 The modern garden stools on the steps of this front porch are so fun and unexpected! The beach bag is a great alternative to a wreath or hanging baskets for spring front porches—so quirky and cute. Despite this porch being small with a steep step, it looks wonderfully welcoming and cheerful. Huge planters to flank your front door are perfect for multiple potted plants like fern, hydrangeas and sweet potato vines. The pots are nestled right into the planters themselves, to be moved or switched out later (without needing to replant or disturb roots). These planters pack a huge visual punch. With the great porch lights, this front porch needs little else to really stand out. 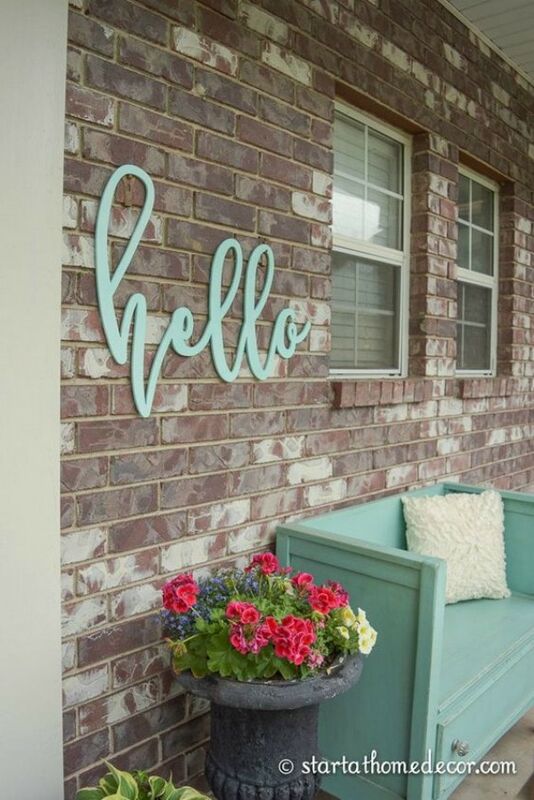 This is such a fun way to add visual impact to your front porch! Paint on a stair runner! This porch looks particularly great with the robin’s egg blue they’ve used to echo the color of the door as well as the southern porch ceiling. Evergreen boxwoods and topiaries are gorgeous, and this is a porch that will look great year-round! I am IN. LOVE. with this porch! The fiddle leaf figs, the front door, The whole nine yards! Using bright green moss in the base of the fig trees is such a great finishing touch. 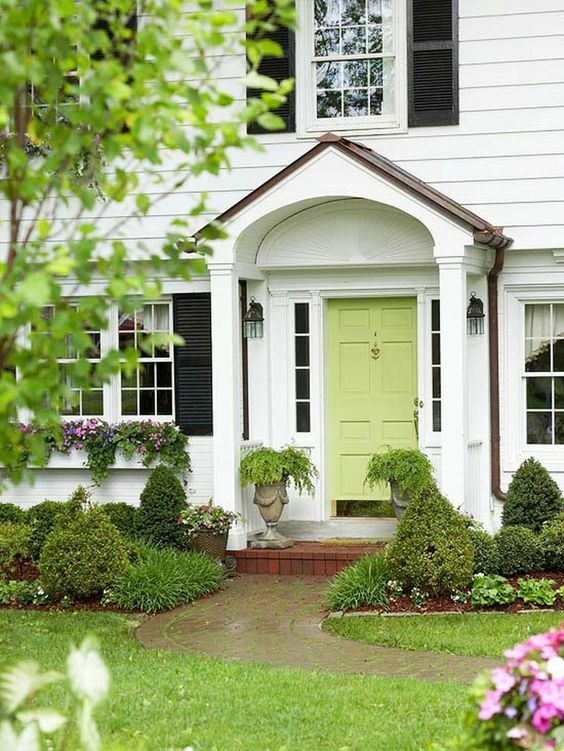 The lime color picks up the bright lime green in the hydrangea pots and again on the wreath on the door. Every piece goes together seamlessly, and the stunning industrial-style porch light crowns the perfect spring porch look. I adore this porch! It has such a sweet cottage look perfect for outdoor living. The blue and white ceramics add the perfect touch of elegance. The bar cart with the copper bucket are ready for outdoor entertaining. The bright cushions on the white wicker furniture are welcoming and the white table is begging for a round of tea and a game of cards while visiting with friends. Another common theme in many of these spring porch ideas is accenting the color of the door with porch accessories. The pillows the beautiful porch swing and two wicker armchairs echo the trim on the windowpanes and soft mint color of the door. With the brown wooden decking and urns, it really pops. A few bright pink and yellow flowers look sweet in this spring front porch color pallet. 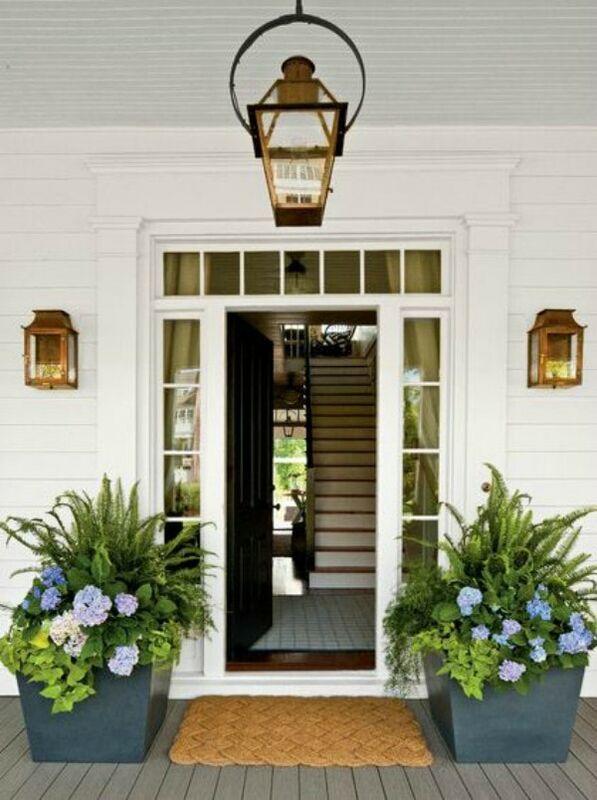 Spring flowers are a happy welcome to an all-white-exterior home. Purple and yellow are complementary colors, so when they’re combined they have a big impact. 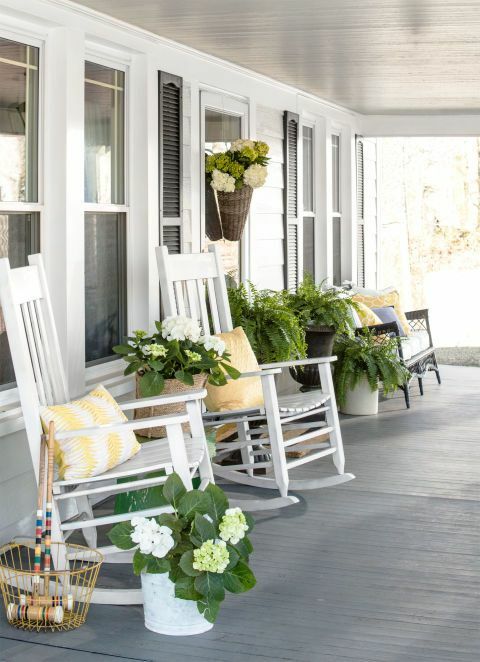 Porch swings always look great with a few neutral pillows.Terracottaa pots also act as a neutral background for the sunny flowers adorning this beautiful spring porch. This porch looks so fresh and ready for spring with a yellow and green color combo! The striped pillows on twin rocking chairs pick up the yellow tone from the hydrangea basket hanging on the door. Ferns are stunning additions to a porch too. I love the basket filled with croquet mallets—who could resist a spring game when they’re right there ready to play?! Start Spring off on the right foot with a big giant “hello!” It doesn’t get more welcoming than graphic designs like this. The color combination of mint and red or mint and bright pink is such a winner too. 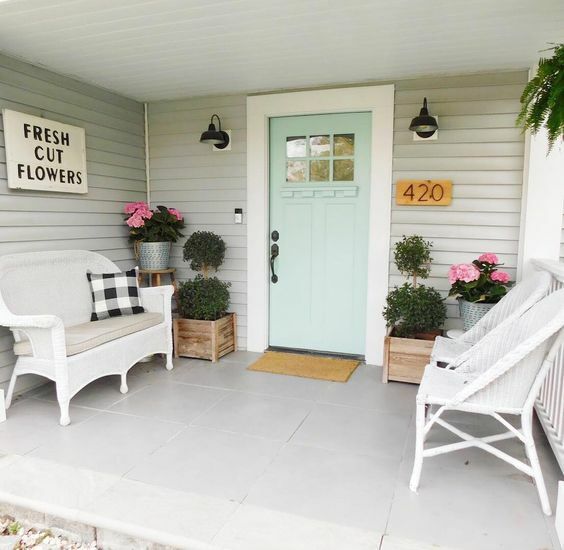 The sign and bench provide a perfect seating area and look so darling next to the urn of bright spring flowers. This spring porch is ready to welcome all who visit! Create a statement with oversized urns for a wow factor. Because pink is essentially “light red” it’s important to remember pink is complimentary with green. When you put the two colors together, especially like these Kelly Green Oriental urns, you really get a powerful look. The flowers are truly stunning here. 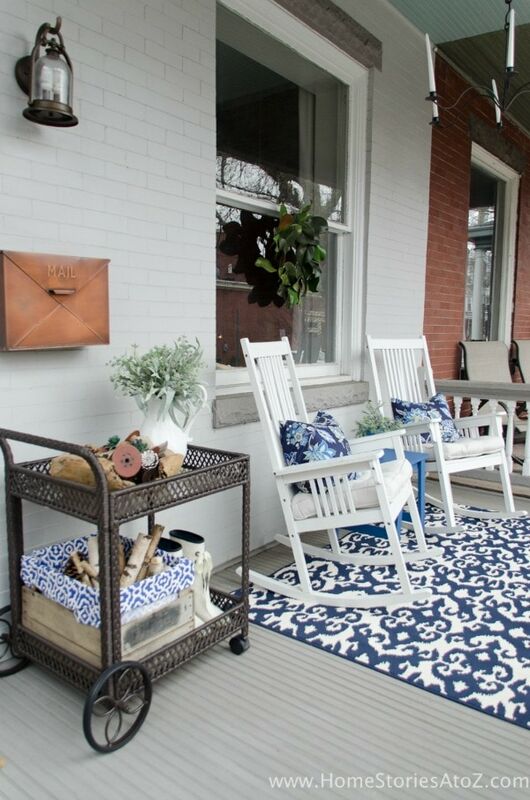 I am into blues lately and this porch has such a cozy feel with a pretty rug and blue planters. Even though this porch is small, it gives plenty of room to sit and relax with the two wooden rocking chairs. The rug creates a seaside feel in the seating area and the turquoise and blue tones work so well together. Note how cheerful the yellow flowers look against the turquoise pot! This door color is the perfect pop for spring! Now, you may not want to paint your door every season, but when you have a bright, fun door or trim color, you can easily highlight it by choosing accents in a similar tone. The lime-green plants next to the door, really allow it to stay the central focus (but add life and cheer to this spring porch look). 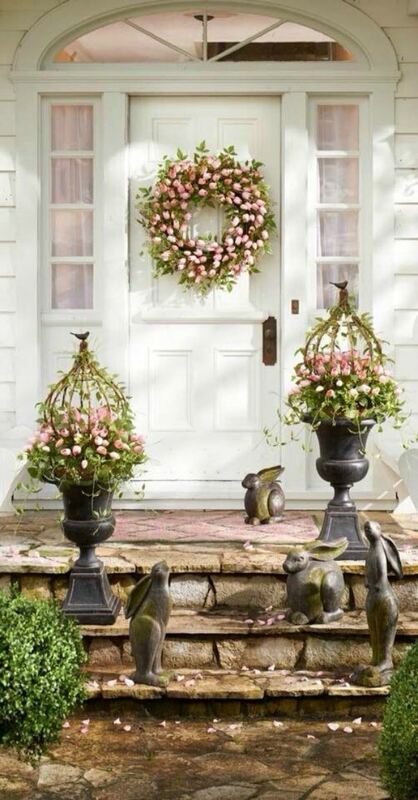 I am in love with all those pink tulips and the sweet bunny statues on this spring front porch! The little birds that adorn the cloche toppers on the urns are absolutely darling. This porch looks like it is absolutely the essence of the spring season, doesn’t it? Note the mat features hints of pink as well, which echo the flowers and the wreath. The vines hanging down and the petals strewn along the path look like the perfect spot for those modern bunnies to frolic. 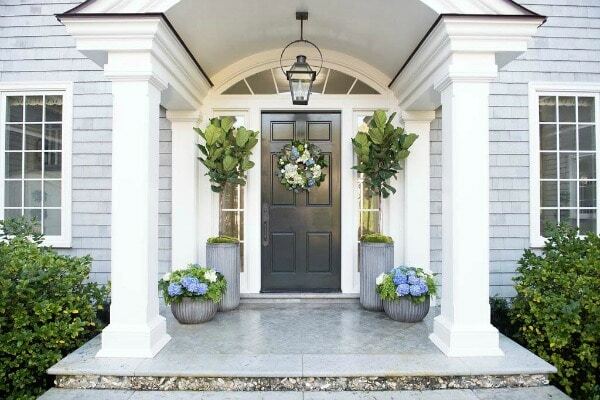 We love how they pulled the color of the door into the urns. It gives it a modern feel but against the white, it still looks bright and airy (not dark). The industrial porch lights and raw wood in the ceiling are a great background for this beautiful front porch. The flowers in shades of pink and white are really what keeps this porch looking romantic and sweet. Adding a few simple touches get any porch ready for spring. So, what do you think? 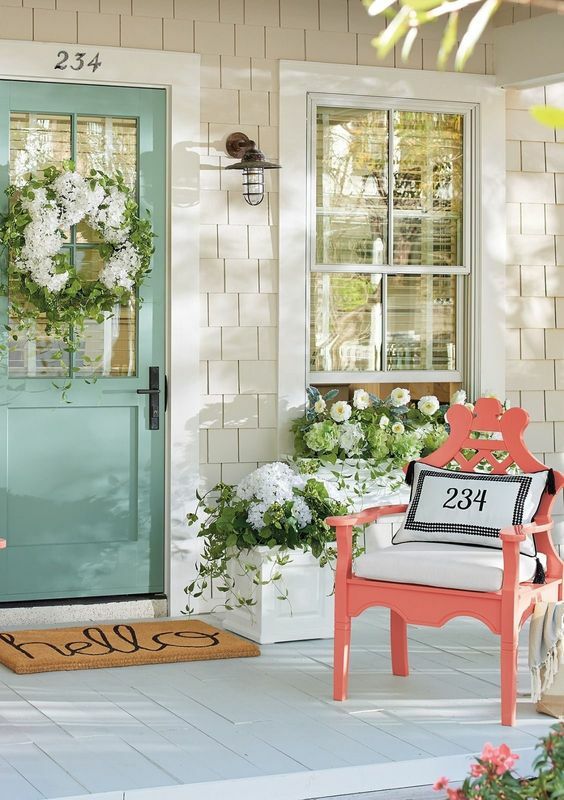 Are you inspired by these fantastic spring front porch ideas? I’ll bet these gorgeous front porches and outdoor spaces have you pining away for warmer weather. I know I am!